Want to take a screen shot on the new iPad Pro? 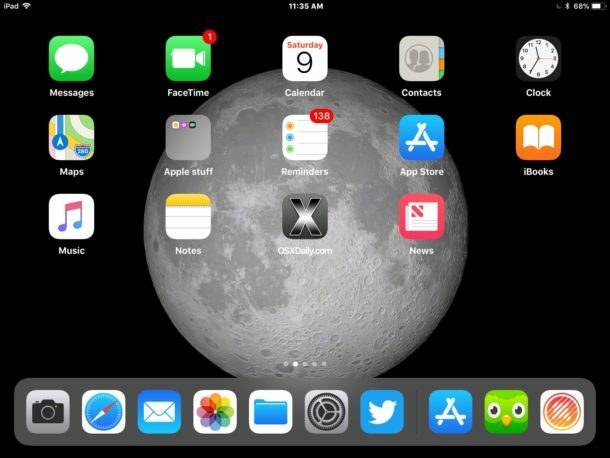 Given that the latest iPad Pro models no longer have a Home button, the old method of taking screenshots for iPad no longer works, as there is simply no Home button to press for snapping the screenshot on iPad Pro. Thus if you’re wondering how to take a screenshot on iPad Pro without a Home button, you’ll need to learn the new method for doing so. Fortunately this is not difficult at all, but it will require a minor adjustment to your iPad Pro workflow and screenshot habits. 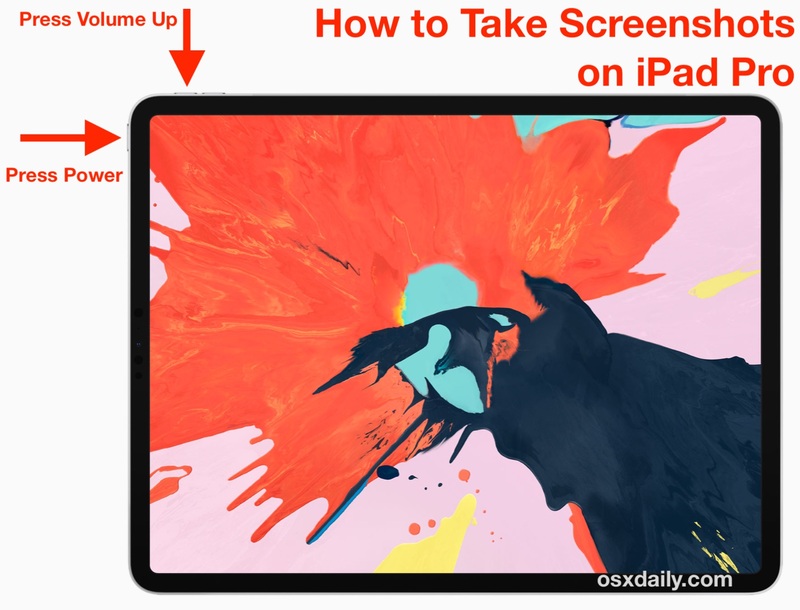 Read on to learn how to take screenshots on the new iPad Pro (2018 models and newer). Pressing the Volume Up button and Power button concurrently will take the screenshot, you’ll know it worked as signified by the camera shutter sound, a quick flash of the screen, and then a screenshot preview will appear in the corner of the iPad screen, where you can quickly share, save, or markup the iPad Pro screenshot has desired. If none of that happens, you likely didn’t press the buttons concurrently, so try again to take the screenshot. If you’re having any difficulty taking screenshots on iPad Pro without any front buttons, then try briefly holding the Volume Up button first and then tapping the Power / Lock button to snap the screenshot on iPad Pro 2018 3rd generation and later. All iPad Pro screenshots are stored in the Photos app in Camera Roll and they’re also automatically placed into their own unique Screenshots album in iOS Photos app. This applies to all new iPad Pro models without the Home button, which is the generation rolled out in late 2018 and newer, and whether it is the 11″ screen iPad Pro or the 12.9″ iPad Pro. Earlier iPad Pro models (and not-pro iPad models) continue to use the old method of Home + Power button to snap a screenshot. While this screenshot method is new to iPad Pro, it’s actually the exact same for taking screenshots on new iPhone models without the Home button too, like the iPhone X, iPhone XS Max, iPhone XS, and iPhone XR. The change may take a little bit to get used to, but it’s important to do so because presumably Apple will continue to remove the Home button from future iOS devices, meaning this Volume Up + Power button pressing screenshot method is likely to become the new default for nearly every iPad, iPad Pro, and iPhone going forward, assuming they don’t have a Home button to press anyway. Note this is specific to screenshots, which are images captured of the screen itself and what’s on the iOS display. Meanwhile to capture a video of the screen activity, you can record the screen of an iPad (or iPhone) the same on all iOS devices, as that process is different and depends entirely on virtualized buttons and options to toggle screen recordings. If you want to have an entirely virtual experience for screen shots as well, that can be achieved through Assistive Touch in the Accessibility settings in iOS. Another thing to note is that this applies to just the iPad Pro models without a Home button. All earlier model iPad Pro that do have a Home button, and any other iPad or iPad mini model ever made that has the Home button continues to use the Power + Home button screenshot method for those iPad models (which is also the same Home + Power press for older iPhone models with Home buttons too), including the 2018 standard iPad and earlier. Another feature taken away by Apple. I use the home button constantly. Well fortunately that one can be worked around by creating a virtual home button using assistive touch if you really need a home button. The far better way is to customize the Assistive Touch icon to do this and much more. See Settings Accessibility Assistivetouch. No buttons to hold. Why is it better to have a virtual button on the screen that requires multiple steps of tapping to take a screenshot, when you can just press two buttons that are right next to each other to capture the screenshot? Then you have to have that AssistiveTouch button on the screen constantly. I just press the two buttons to capture the screenshot on iPhone and iPad, I think that is fast and easy. The virtual home button created with assistive touch doesn’t require Multiple steps of tapping to take a screen shot, it only takes several steps to set it up the first time but it may still be worth it for some users. 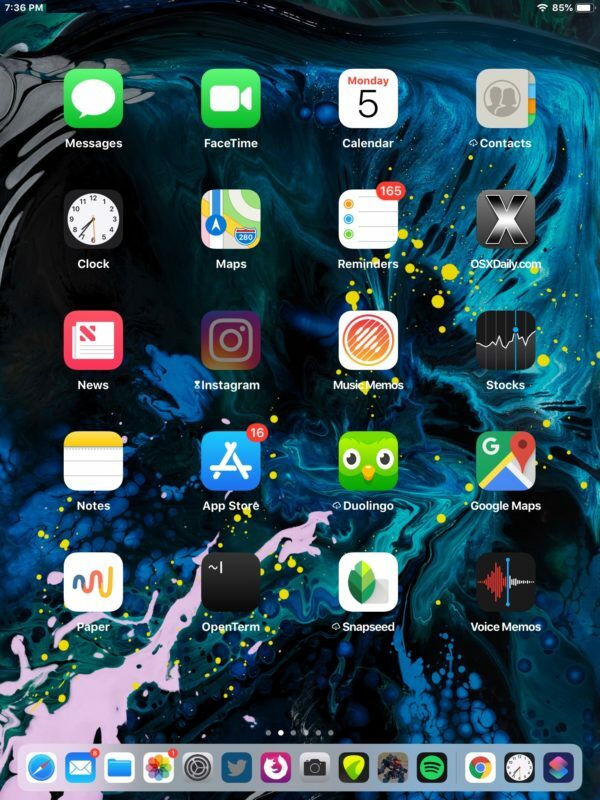 Once you’ve set it up, you can take a screenshot whenever you want to by simply holding the power button and the virtual home button at the same time, just as you would on an older device with a physical home button. Edit: Or you can set the virtual button asa screen shot button, then you just tap on it every time you need to take a screenshot. Just as fast as pressing power+volume up, but maybe a bit more comfortable. 2. Tap on the minus sign to reduce the number of icons to only one. 4. Tap on <Assistive touch on the top left to go back, and then turn on the ‘assistive touch’ toggle switch. Voila! you now have a virtual home button that works just like the physical home button did on older devices. Additionally, you can also set up the virtual button to be used only for taking screenshots instead by selecting ‘screenshot’ instead of ‘home’ in step 3.